We practices scientific, data driven and statistical approach. Our structured database aids us to visualize demographic data, performance data, job history, compensation, mobility, assessment and training. We provide all the analytical data of employees that helps the management in decision making. The iPlex provides HR services that go beyond managing payroll and attendance, to allow clients to outsource their entire HR function and responsibility to us. We have a strong track record of managing HR responsibilities for growing clients. - Configurable, Analytical Dashboards : A live, up to date dashboard gives you instant updates about the state of your company. Employee costs, Statutory costs, attrition, average years in service, etc. and many other performance indicators are easily tracked, automatically. Advaya Humanistic Systems Pvt. 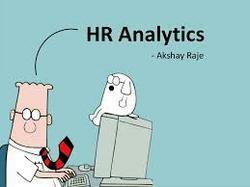 Ltd.
We at NetChanakya HR offer data analytics services for HR managers during any troublesome period. These analytics services deliver strong and perfect backbone of recruitment analytics.